Mums are fast becoming a powerful economic force in the economy, and a very influential community. “Mumpreneurs” generated £7B in the UK and supported 204,000 jobs last year. Many of these mums are running small businesses on eBay but a lot also run blogging sites giving tips on being a mum and everything that comes with parenthood. 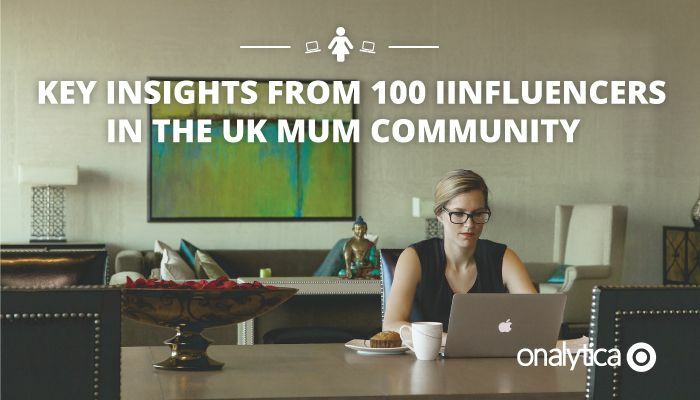 We were very interested to see which influencers were driving the most conversation, so we identified 100 influencers in Mum community to see who was leading the discussions. We discovered a very engaged community, below you can see a network map of the online conversation created with our Influencer Relationship Management software IRM. 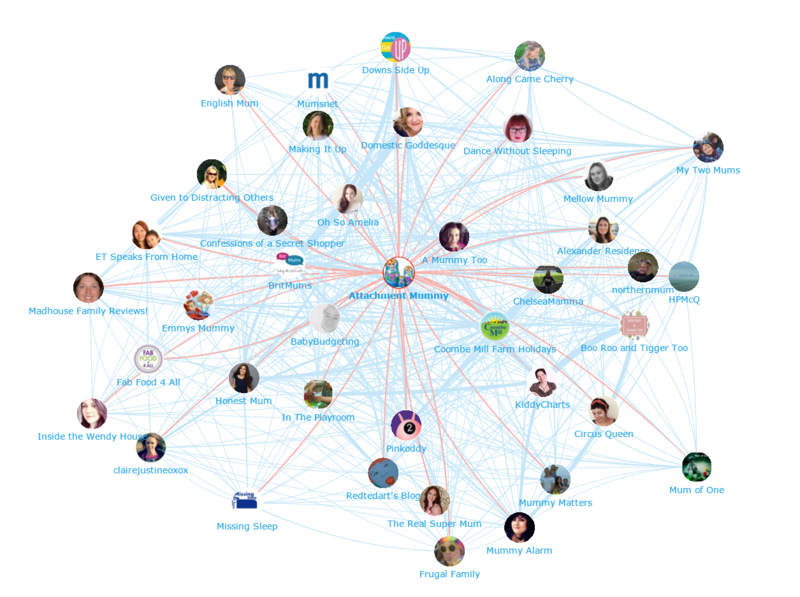 This map shows the influencer “Attachment Mummy” at the centre, and the conversations to and from the influencers in her field. Be sure to click on the map to enjoy the full size network diagram in greater detail! 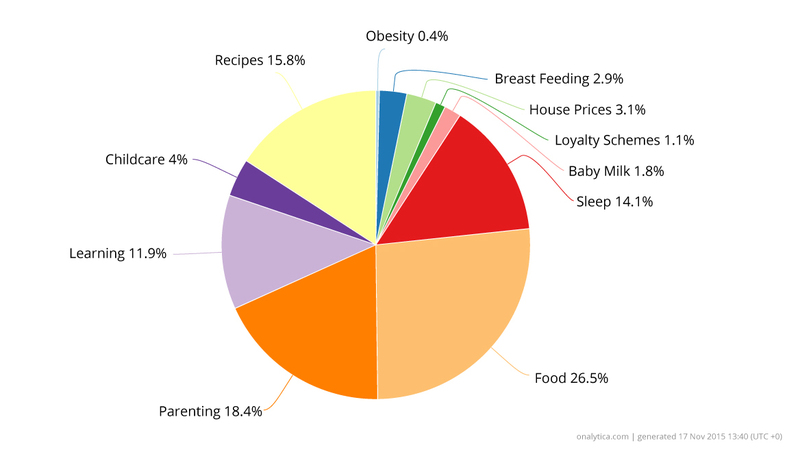 We were also keen to learn what topics this Mum community care about the most, so we analysed their conversations from 1st January – 16th November 2015 to discover what the key trending topics of conversations were. It was interesting to note how important the topics of food and recipes was to this community. If you are interested in learning more about identifying, managing and engaging with influencers click here to get in touch! With all the discussion and resources available online, our analysis produced a great set of independent influencers and communities. Influencer Marketing campaigns generate impressive results, the average earned media value (EMV) from US influencer marketing programs was 1.4 times higher in H1 2015 than the overall average in full-year 2014. At Onalytica we love building these lists and want to give back to our loyal readers as much as we can. If you’re interested in other topics (such as Machine to Machine, Wearable Tech, Internet of Things) be sure to have a gander on our blog or why not propose some topics to us on twitter? We also build some very cool software to manage all of these influencers. Get a free demo today by clicking the button below! Disclaimer: As ever with these lists, it must be stressed that the ranking is by no means a definitive measurement of influence, as there is no such thing. The brands and individuals listed are undoubtedly influential when it comes to driving discussion in the Mum Community. The PageRank based methodology we use to extract influencers on a particular topic takes into account the number and quality of contextual references that a user receives. These calculations are independent of a users number of followers, but we do filter our lists based on how much a user is engaged in the conversation and the influence they drive through their networks.